River Red Gum | Infonet Biovision Home. English (River red gum); Kamba (Musanduku); Kikuyu (Mubau); Luo (Bao); Swahili (mkaratusi). 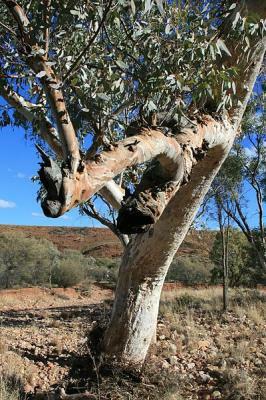 It is widely distributed in its native Australia and is one of the first Eucalyptus spp used elsewhere, both in the Mediterranean and the tropics. It was first planted in Africa around 1900. Its native to Australia. The red heartwood of E. camaldulensis is hard, durable and relatively termite resistant. Young trees require protection from termites. It was introduced in Kenya mainly for supply of firewood for railways. Altitude: 0 - 1500 m, Mean annual temperature: 3 - 22 to 21 - 40 deg. C, Mean annual rainfall: 250 - 2,500 mm, Soil type: Grows best on deep, silty or loamy soils with a clay base and accessible water table. It tolerates water logging and periodic flooding. It is one of the species found to be most tolerant to acid soils. Orthodox storage behaviour for 3-10 years; viability maintained for 4 years in hermitic storage at room temperature; viability maintained for several years in hermitic storage at 3 deg. C with 6-10% mc. A fully grown E. camaldulensis tree may produce a million or more seeds annually, and may continue so for a century (Lars Schmidt, 2000). There are 700 000-800 000 seeds/kg. Apiculture: E. camaldulensis is a major source of honey, producing heavy yields of nectar in good seasons. The honey is light gold and of reasonable density with a distinctive flavour. It has been marketed as a straight line for several years. It crystallizes readily. The tree is particularly valuable for building up bee populations, especially when pollen from the ground flora is available to provide variety. Fuel: The firewood is suitable for industrial use in brick kilns but is not preferred for domestic use because it is too smoky and burns too fast. However, it makes good-quality charcoal. Fibre: E. camaldulensis is used for pulp and paper production. It is also planted for hardboard, fibreboard and particleboard. Timber: Given its great strength and good durability, the wood is suitable for many structural applications, for example, railway sleepers, poles, posts, floorings, wharves, ship building and heavy construction. Tannin or dyestuff: The bole yields a gum that can be used as a dye. Essential oil: Some tropical provenances of E. camaldulensis are rich in 1,8-cineole leaf oil and are potential commercial sources of medicinal-grade eucalyptus oil. Medicine: The oils are used as an inhalant with steam and other preparations for relief of colds and influenza symptoms. Because of its refreshing odour and its efficiency in killing bacteria, the oil is also used as an antiseptic. Other products: The bole has some potential for shiitake mushroom (Lentinus edodes) cultivation. Shade or shelter: E. camaldulensis is widely planted for shade and shelter. In Sudan it is planted to protect crops from blowing sand. Ornamental: Its graceful form is attractive for avenues and gardens. It is practicable by judicious trimming to shape it to the requirements. Intercropping: With its light crown, E. camaldulensis is well suited for growing in arable fields. Intercropping maize with trees planted at 5 x 5 m gives satisfactory yields. Insects such as termites and aphids and rodents may be troublesome to the tree, and both physical and chemical measures are used to control them. Young trees and those weakened by drought can be badly infected by moth larvae, eucalyptus snout beetle, termites and eucalyptus borer. In the nursery, E. camaldulensis is susceptible to various fungi causing damping-off and leaf diseases. Albrecht J. ed. (1993). 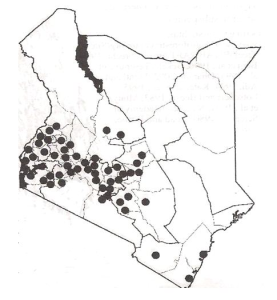 Tree seed hand book of Kenya. GTZ Forestry Seed Center Muguga, Nairobi, Kenya. Bein E. (1996). Useful trees and shrubs in Eritrea. Regional Soil Conservation Unit (RSCU), Nairobi, Kenya.